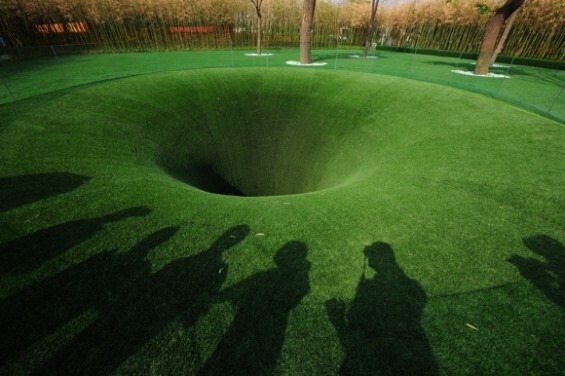 “The Big Dig” art installation depicting a hole to China from Germany. Hello fiction writers and welcome to the first Friday Fiction Facts of 2013! As a kid, did you ever think about digging a hole to China? That’s what you were told, right? 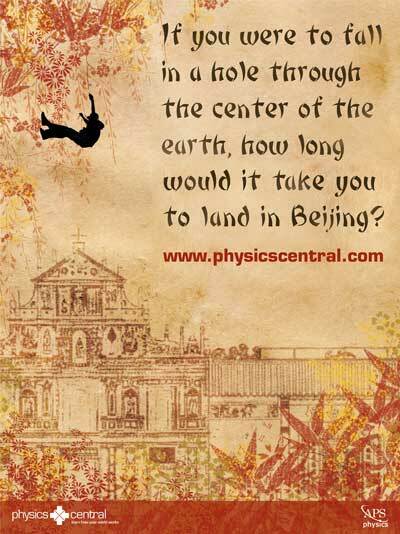 That if you dig through the center of the earth, you’d come out in China. I tried it when I was a child and actually made pretty good progress. With the help of a bunch of kids in the neighborhood, we managed to dig a hole a good 5 feet deep – deeper than we could see out of! But the sand was just too uncooperative and our hole had to keep getting wider and before we could get to China the streetlights came on and we had to go home. But maybe for your fiction story you’d like to actually do that – have a hole through the center of the earth where people could jump (or ride in a capsule) through to the other side, a la Total Recall 2012. In that movie they didn’t dig to China but bored a hole from Europe to Australia through which people traveled in a “gravity train” called The Fall. So the question today is: could that work? Could you dig a hole through the earth, jump in (with or without a capsule) and come out the other side? Well, of course we can’t dig that far, and to “tunnel” through the earth’s molten core would present its own set of problems, but we can just let that be the fiction part of the story. Let’s assume you had a machine that could drill the diameter of the earth, 8000 miles – or even 4,000 miles. We’ll let the folks on the other side meet us halfway. Alright, you’ve plotted a land-to-land dig, and you’ve dug the hole, and in your story a human can magically survive the g-forces, heat, atmospheric pressure, and everything else that would assault the body in such a trip. I guess there is nothing left to do now but jump! But now back to Total Recall. First of all, the diggers of the hole apparently forgot to confirm step one – are Britain and Australia antipodes? It turns out not. 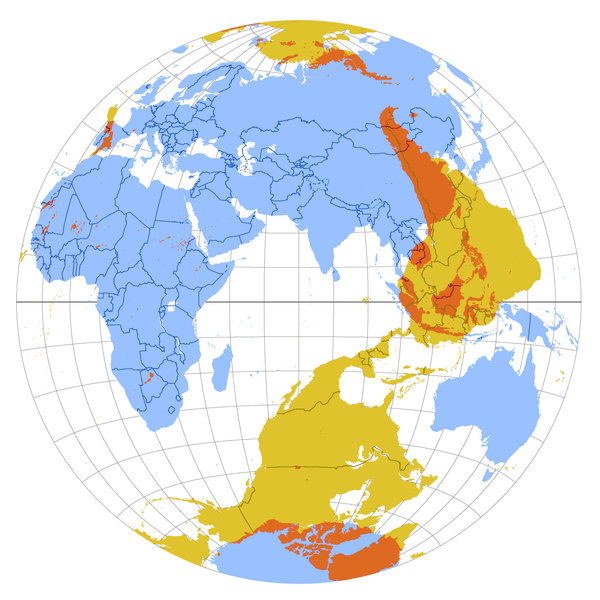 All of the antipodes of Australia are in the North Atlantic Ocean and the antipodes of Britain and Ireland are in the Pacific Ocean. Ok, so maybe their tunnel doesn’t exactly go through the center of the earth. That’s fine. Let’s turn to the gravity train. The physics-minded have been happily debating the physics of The Fall since the movie came out last year. The idea of a gravity train is not a new one. It’s been around since the time of Newton. In theory it would work. If one ignores friction and assumes that the earth to be a solid, uniform, non-rotating sphere, then anything you drop into a hole through earth would appear out the other end in 42 minutes. From there it would fall back into the hole forever to oscillate between the 2 surface points. It’s 42 minutes no matter how you slice it. 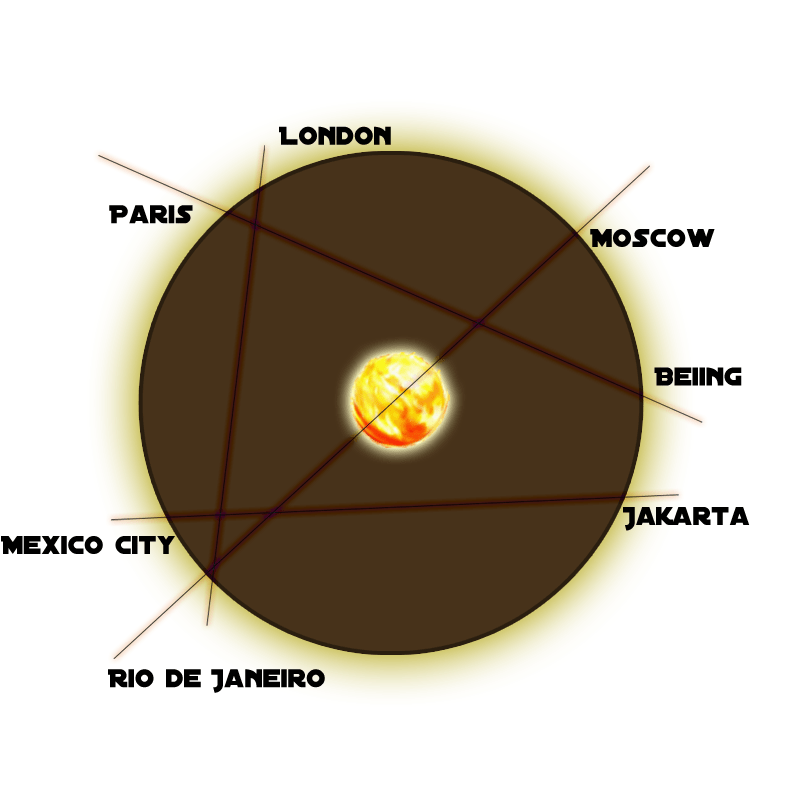 Here’s an interesting thing: No matter what two points on earth you connect via a hole through earth –even cutting across say from Paris to Tokyo – regardless of distance, the time it would take to “fall” through to the other side will still be 42 minutes. This is because the gravity would be proportionally less the farther “off-center” you drill. At this point, I’m not even going to pretend to understand the physics of the gravity train. What I am going to do is tell you that knowledgeable people have found fault with it. I’ll just provide you with links so you can go read their analyses and the many comments that go along with them. Focuses on velocity and its effect on the people. Good back and forth discussion in comments as well. I liked this comment on how the ride would feel to a passenger not buckled in. (I’m not vouching for its accuracy, just found it interesting). Rhett Allain: Wired – How Long Would It Take to Fall Through the Earth? When the elevator gets halfway on its trip to the other side of the Earth, the people become weightless and float around… Yes, there is a location where the gravitational force is zero (the zero vector)…. [but] …the people in the elevator would feel weightless during the entire trip since they are in an elevator that is accelerating due to just the gravitational force. It is interesting that this idea that they would be weightless at the “gravity flip over point” is the same idea that Jules Verne used in his novel From the Earth to the Moon. The math again, step by step. Total Recall Gravity Train through the Earth; The physics are BS in the extreme. Not really a physics analysis. Points out the obvious impossibilities of digging such a hole and surviving the extreme pressure, temperature, and seismic activity. Nice history of the idea. So now you know the math and the obstacles, go dig your hole! Let’s see: 42 minutes. Given that the earth is rotating all this time, if you were going straight through the core (theoretically, in practice you’d roast) — the hole would have to be curved to allow for that 42 minutes of rotation. Depending on where you started and end on earth, that would be something like a knuckle ball. And of course rotation would not have the same effect coming back — since the rotation continues in only one direction. Without the curvature of the hole you would encounter friction on the sides of your elevator and when you got to the other side you’d be a few hundred metres short of full exit, only to fall…omg, it’s be worse on the way back! Friction being what it is you’d end up finally coming to rest in the molten core, where, as everyone knows, it is hot as hell. I disagree. You do not have to account for rotation.